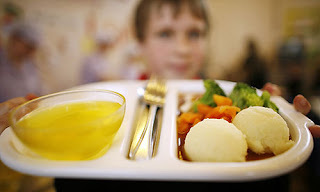 At today’s Lib Dem conference in Glasgow, Lib Dem Leader and Deputy Prime Minister, Nick Clegg, revealed his “showstopper policy” – that the Government is proposing to offer free school dinners to children in the Reception, Year 1 and Year 2 stages of education in England from September 2014 (i.e. 5-7 year olds). Money is being provided for Wales, Scotland and Northern Ireland to emulate the English scheme, however, it will be up to the respective devolved governments to decide whether to spend this on free lunches. The £600m plan is estimated to save families an average of £437 per child and, in a Coalition trade-off, the Lib Dems have given the go-ahead for the Conservatives to announce a tax break for married couples which could be worth around £3 per week. Free school dinners will go some way to make up for what some viewed as the penalising of middle income families by recent changes to Child Benefit. According to The Independent, some 400,000 children already receive free meals but an estimated four in 10 children living in poverty do not currently qualify. "Shouty Mummy Is In Da House"
I hope they do introduce it in Wales as well, the proportion of children living in poverty in the nations is higher than that of large parts of England, and I see a lot of children who don't qualify for free school meals at the moment, but would really benefit from it. That said, would Squeaky (and Ieuan, come to that) actually eat much of it? Quite agree and I think the Welsh Assembly will be deeply unpopular if it doesn't introduce it. Ieuan claims to have eaten potato and "a pea" this week. Hmmm.